I am fairly experienced with command blocks and programming, but I must admit that JSON is not what I consider a nice language. This (fairly large) command should, in theory, make a sign that I can right click in order to get a book with some special things. 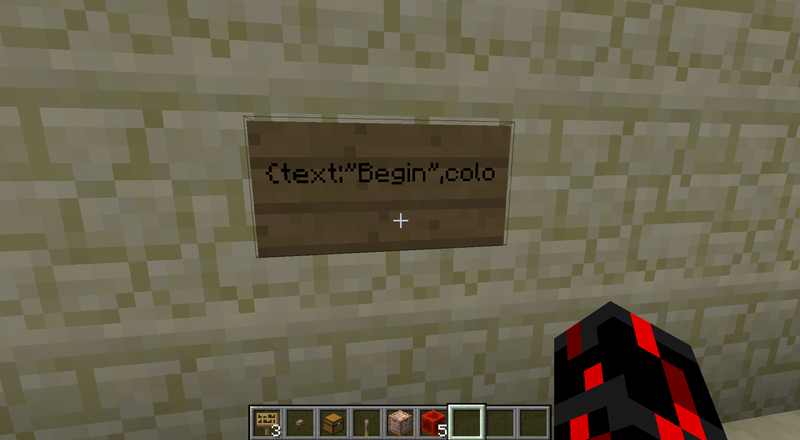 \"/scoreboard players set @p Power 1\"
Instead, it places a sign on the wall like the picture. I assume this is because I don't know how to nest escaped strings recursively. Anyone who can tell me the correct format for this would be greatly appreciated. When you begin the Text1 tag, any quotes inside of it that aren't meant to close the tag will need 1 backslash, since there were 0 previously. Once you arrive at the 'value' tag, 3 backslashes are needed since the current backslashes needed to close the tag is currently at 1. Single quotes and double quotes are escaped separately. Since you did not use single quotes in a depth higher, you do not escape them. You also had a single quote instead of escaped double closing the 'value' tag. I suspected that it might be something like that, but I didn't know what would go where.